In the modern world we live today there is a pandemic of anxiety and panic attacks. People feel more and more stressed, anxious, afraid. The funny thing is that we live in the best times human civilization has ever lived. There is advanced technology, safety and connection globally. However, our anxiety is due to our hectic lifestyle that doe not live us enough room to sit with ourselves and feel our emotions. Our lifestyle creates our anxiety. There are people who notice the symptoms, who go through the process and deal with it. However, there are people who have accepted their anxiety and live with it. These people who live and function with constant anxiety are called people with High Functioning Anxiety. Here are the signs you might be one of them. 1. You are always busy. Being busy is a sign of not being peaceful with yourself. It’s a manifestation of feeling like you are always one step behind for something. Being buys creates anxiety by itself because you are always racing with time and the world around you. 2. You are a people pleaser. People who have anxiety usually feel like they are guilty for something. The anxiety makes them unable to entertain more drama so they try to avoid stepping on anyone’s nerve. People who live with anxiety will neglect their needs to please others. Because when you feel anxiety you are scared but you don’t know of what, you are looking for everything to be in it’s place. Everything is suspicious and you need everything in order. This makes people who live with anxiety perfectionists. To reduce the constant hum of anxiety in the background people with anxiety will get addicted to distractions that make them escape reality for a moment. These addictions can be TV shows, movies, social media, games, alcohol, and other things. 5. You hate little social things. Anxiety is a state that is neither here nor there, you are not scared but you are not relaxed either, you expect impending danger and you don’t know from where. That’s why people with anxiety avoid phone calls, messages and meeting new people. 6. You are an overthinker. People who have high functioning anxiety can be really successful. However, they will overthink everything. They will worry about the littlest things and they will imagine every scenario, possible and not possible to make sure. 7. You are overly judgmental. If you have anxiety and you accept living with it without doing anything, you will create a really judgmental voice in your mind so you’ll be able to notice even the slightest detail that’s out of place. 8. You have periods when you isolate yourself. People who deal with anxiety need to do it on their own. They need to sit with themselves and deal with the bottled up emotions waiting to be felt. 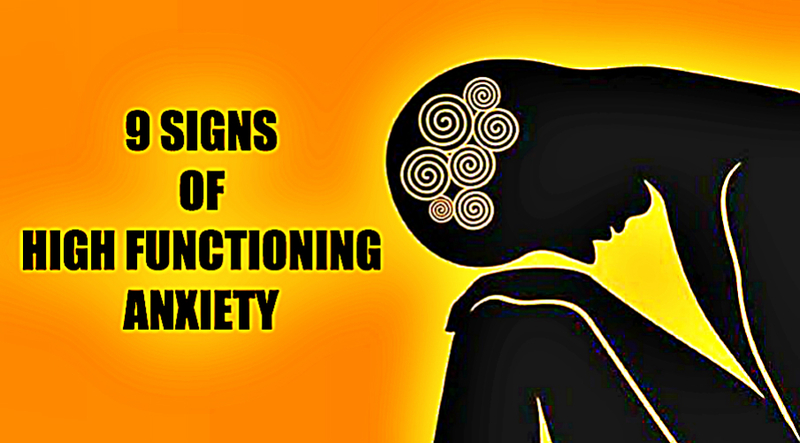 People with high functioning anxiety will be pulled to periods of isolation but they will avoid facing their anxiety. 9. Your body posture is shy and slouchy. Every emotion we keep suppressed has some kind of an impact on our physical body. The emotions we feel dictate most of how our posture is expressed. People with anxiety tend to have shy and slouchy posture, like they are weak and want to avoid conflict.